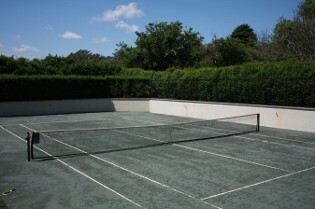 Here are some commonly asked questions we hear regarding tennis court resurfacing and repair. These address most of the questions people have with construction, repair, and resurfacing but if you have another question regarding Basketball, Bocce or any courts not listed, please send us an email with your question and we’d be happy to answer it for you, just click the green "CONTACT US" button above. • How Much Does it Cost to Resurface a Tennis Court? • What causes streaking on a tennis court surface? • Why do the white lines crack on a tennis court? Once a month is suggested. Watch for evidence of mold or mildew in shaded areas and corners where organic debris tends to accumulate. Indoor courts require both frequent vacuuming and at least one annual wet cleaning with mild detergent solution and soft bristled equipment. Acrylic coatings do not support fungus growth, so growth of fungus or mold is a result from food and drink spills, decaying matter, or other foreign materials on the surface feeding these organisms. • Rinsing court with water is usually sufficient for general cleaning. If there are visible stains on the court surface, a mild detergent can be applied prior to gentle scrubbing with a soft bristled brush. • Combine 4 parts water with 2 parts TSP (trisodium phosphate) and 1 part household beach, when mildew is present. The standard resurfacing cycle for acrylic sport surfaces is 5 to 8 years. The asphalt and concrete base of a tennis court, no matter how well built, can exhibit cracking and low spots known as “birdbaths”. There are many "natural" and unavoidable factors that can contribute to these problems from ground movement and sinking, to tree roots and improper construction or base mixes. While many of the cleaning and protection functions can be handled by the court owner or maintenance crew, pavement repairs and resurfacing is best handled by a sport surfacing professional. • Performance of the drainage system. • Areas of premature wear or damage. Identify causes. • Condition of tennis court accessories: Tennis nets and net posts, windscreen, center strap, etc.